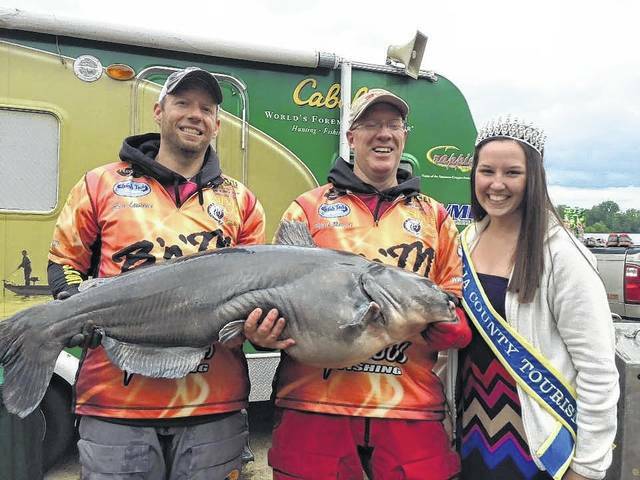 OHIO VALLEY — The Cabela’s King Kat Tournament Trail will hit the waters of The Ohio and Kanawha Rivers at Gallipolis on May 12. This is the opportunity for catfish anglers to compete for cash, prizes and a chance to advance to the Cabela’s King Kat Classic Championship. This year’s Classic Championship will be held Sept. 14 – 15, on the Ohio River at Jeffersonville, Ind. and will have a guaranteed payout of $110,000 in cash and prizes. Late registration will be held Friday, May 11 the day before competition at Super 8 Motel, 321 Upper River Road, Gallipolis, from 5-7 p.m. Captains meeting/seminar will follow at 7 p.m. Must be a member of the King Kat Association to fish this event. A one-year membership is $30. To pre-register go on line to: www.kingkatusa.com or call (502) 384-5924. Legal waters for the event will be: Anglers may fish the Ohio River from Bellville L&D, South to the Robert C Byrd L&D. Also up the Kanawha River to the Buffalo Bridge (869). The tournament weigh-in will be held at Gallipolis City Park Boat Ramp, Gallipolis. Tournament hours are 6:30 a.m. until 3 p.m. All anglers must be in the weigh-in line by 4 p.m. with a 5-fish limit per team. To help preserve the sport only live fish will be weighed in and all fish will be released after the tournament. For a complete list of rules visit www.kingkatusa.com or phone Cabela’s King Kat Headquarters at: (502) 384-5924. Gallia County Convention & Visitors Bureau is once again welcoming all Cabela’s King Kat anglers and their guests and hope they take the opportunity to enjoy the many attractions in the area. For more information about the city please call (740) 446-6882 or visit their website at: www.visitgallia.com. Host lodging for the event will be Super 8 Motel, 321 Upper River Road, Gallipolis. For reservations, please call (740) 446-8080. The number of rooms may be limited in some areas, so it is recommended that participants make their reservations early. In conjunction with the tournament the Cabela’s King Kat Tournament Trail will hold the Cabela’s King Kat Kids event on Saturday, May 12 at Bob Evans Farm Pond, Rio Grande. The event is free of charge and open to all youth 12 and younger. Sign up is from 8 a.m. until 9 a.m. with the Kid’s Fishing Event starting at 9 a.m. until 11 a.m. All children will receive a prize just for entering. Bring your favorite rod, reel and bait and show your true fishing ability. All children must be accompanied by parent or guardian. Prizes for winners will be given in two age groups, 0-7 and 8-12. The event is free to all children 12 and under with all participants eligible for a chance to win one of the six, Outdoor Promotions $1,000 scholarships. Outdoor Promotions and anglers have contributed $350,000 to the “Kids” Scholarships since 1997. Check the website www.kingkatusa.com and like Cabela’s King Kat Facebook Page for more information.